Anyone who lives in Pittsburgh knows that is the epitome of a sports town. The city bleeds black and gold for its trio of professional franchises, so it should come as no surprise that Pittsburgh made Wallethub.com’s list of Best and Worst Cities For Sports Fans (check out full article here). The rankings took in consideration for all five major sports: football, baseball, hockey, basketball, and soccer (yes the MLS has finally gained enough recognition to be considered with the fab four). The Burgh was voted the best city for hockey fans and was kept out of the number one spot due to its subpar rankings in basketball and soccer – ranking 85th and 95th. Yet, how can a city with only three sport teams crack the top five? Is the allure of only having one team to focus on during the height of each sport season? I mean without a basketball team fans can focus on hockey during the winter months; without a MLS team football fans can focus on baseball and the start of American football rather than battling for viewership with sports’ sharing the same season. I think having only three professional sports teams helps, but the true passion behind Pittsburgh’s fandom comes from the majestic allure each of its team’s pull in. The allure starts with all three teams sharing the same colors – the legendary black and gold. No other city in America can say that and it is a novelty many Pittsburghers take great pride in. Despite sharing color schemes each team captivates fans in their own unique way. Take the Steelers for example. Once the laughing stock of the NFL, then suddenly -seemingly overnight – a young ambitious coach by the name of, Chuck Noll, created the most successful franchise of the 1970s. The team’s fan base grew with success, but so did the team’s appeal. The Steelers currently hold the most Super Bowl titles out of any NFL team, continue to be a perennial playoff contender, have produced a plethora of Hall of Fame players, and to top it all off they have had only three head coaches in the franchise’s history. That sort of tradition and reputation for sustained success is what makes Steelers Nation so powerful. The Pirates 1979 World Series win helped catapult Pittsburgh into sport city folklore, crowning the nickname, The City of Champions. However, unlike their North Shore counterparts, the Pirate’s charm comes from a sling of historical MLB moments. Whether, it be their epic 3-1 comeback in the 1925 World Series over the Washington Senators (a feat that has never been duplicated) or ‘The Greatest Homerun Ever’ Bill Mazeroski’s solo walk-off homerun to give the Buccos a 10-9 victory of the New York Yankees. Their place in baseball immortality secured. The Pirates have always and will always be a fan favorite to any baseball fan. Producing legends like Roberto Clemente, Dock Ellis, Tim Wakefield, Barry Bonds, and today’s current superstar, Andrew McCutchen. Even on the wrong side of history, during their two-decade playoff drought, the Pirate fans remained loyal. Today with the help of Cutch and Co., they’ve gone from lovable losers to possible NL Central champs. Lastly, comes the late-blooming Penguins. The Pens were an awful franchise in their early years and one that certainly played third fiddle behind the Steelers and Pirates in the 1970s. Then suddenly, in 1984, the arrival of Mario Lemieux changed everything. The lowly franchise quickly became a NHL powerhouse winning back-to-back cups in 1991 and 1992. Producing stars and fan favorites like Jaromir Jagr, Ron Francis, Luc Robitaille, Martin Straka, and Darius Kasparaitis the Penguins rallied off 11 consecutive playoff seasons from 1990 to 2001. The team’s darkest hours came in the 2000s, where superstar after superstar left the team (we all remember the Jagr to Capitals trade and Kovalev’s final season) and fans watched as new stories about the team’s possible move to Kansas City caused city wide panic. Yet, under the guidance of Penguins legend-turned owner, Super Mario managed to produce one last bit of magic –striking a deal to keep the team in Pittsburgh. Uniquely, enough history repeated itself as the deplorable 2000 seasons (just like those 1970s seasons) paved way for the Penguins to strike gold in the NHL draft again. In 2005, they drafted Sidney Crosby – this generation’s Lemieux. With the help of Sid the Kid and fellow superstars Kris Letang, Malkin, and Fluery the Penguins are in the midst of a 9-year playoff streak with one more Stanley Cup to boot. The teams history of epic highs and pitiful lows make it one of the most intriguing in all of sports. Not to mention the interstate rivalry between the Flyers and the love/hate relationship Sid the Kid produces with rival NHL fans. Now, I don’t want to dive into the decade-by-decade history of each team. Instead, I just want to reiterate that Pittsburgh is one of the few cities in America that remains loyal to their teams no matter the roster, the coaches, or the superstars. There’s no doubt the early success of the Steelers and the Pirates certainly helped aid the Burgh’s unmatched fan loyalty (as did the subsequent list of Hall of Famers for all three teams). However, there is no denying the true reason why Pittsburgh is such a sports town is because it loves all their sports teams. If you visit St. Louis you quickly realize it is a baseball town in love with their Cardinals above all else. If you swing through Detroit it is easier to realize they love their Red Wings more than the Pistons, Tigers, and Lions combined. Heck, Green Bay is strictly a football town. And then you have Pittsburgh. The lone city in America that treats each team with the attention, respect, and passion it deserves during their respected season. It may be fair to say that Steelers Nation draws the most nationwide attention, but make no mistake this city loves the Penguins and they’ll raise the Jolly Roger every chance they get. 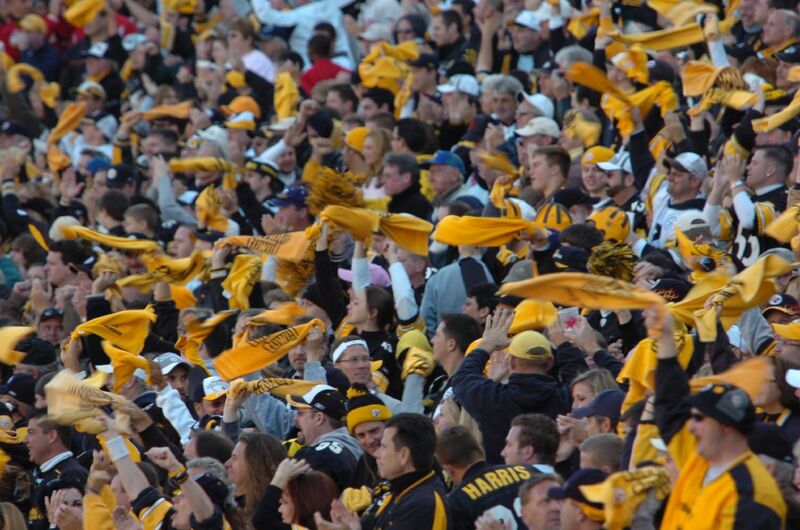 I don’t care what the survey says, Pittsburgh has the best fans and the Burgh is the best sports city in America. Period. This entry was posted in Fantasy Sports, Pittsburgh Sports and tagged MLB, NFL, NHL, Pittsburgh, Pittsburgh Penguins, Pittsburgh Pirates, Pittsburgh Sports, Pittsburgh Steelers. Bookmark the permalink.